Filipinos are known to be festive and merry. A great way to celebrate special occasions here in the Philippines is to gather with friends and families while eating delicious foods. Pinoys are food lovers. For every occasion we can think such as birthdays, graduations, anniversaries and even the burial of a loved one we lost, we all cook delicious food to feed guests. There are many dishes that Pinoys love to eat, but here are the top 10 foods that are our favorites. This is the number one food in every Filipino home, especially on special occasions. Known to be an influence from Spain, lechon comes from the Spanish word lechon, referring to a roasted suckling pig. 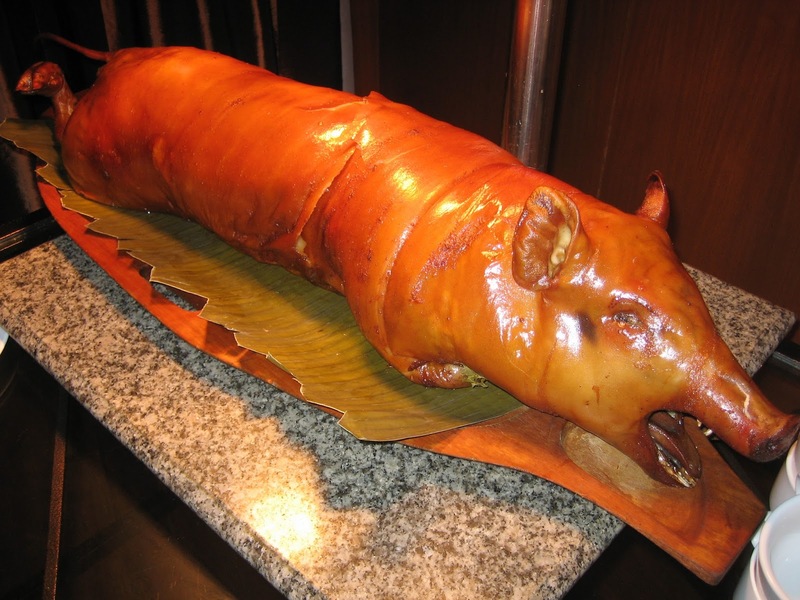 Basically, lechon is a whole pig roasted to a perfect crisp over charcoal. The whole pig entrails removed is put in a large stick mostly from bamboo sticks, and grilled in a pit of burning charcoal. All sides of the pig are roasted for several hours by turning the pig over and over. This is best served with liver sauce or ketchup. One dish that is loved by Pinoys and even some foreigners is Adobo. This is a popular dish which natives of every city in the Philippines have versions of. The Bicolanos put coconut milk in their adobo. Some people add pork livers while others include soy sauce in theirs. There are hundreds of ways to cook adobo so this dish is truly beloved by every Filipinos. The word adobo comes from the Spanish word “adobar” which means marinade sauce. 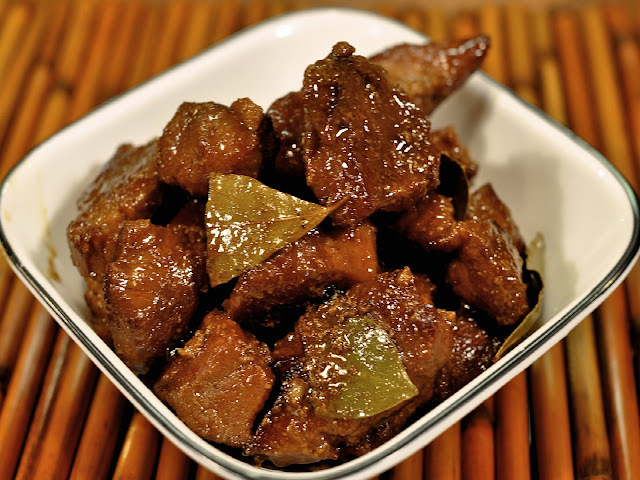 True to its word, adobo is marinated in vinegar, soy sauce, salt and garlic then browned in oil. No Filipino festivities and occasions will be complete without our own take of Adobo. Another food that we Pinoys love to eat is Kare Kare. This sumptuous delicacy is a famous Philippine stew. It has a rich peanut taste with a mix of ox tail meat and various vegetables. Pinoys here and abroad love to cook Kare Kare, especially for special gatherings and occasions. Some Filipinos have different ways to cook Kare Kare. Most used ox tail meat, but others also use pig legs and beef. The vegetables that are usually cooked with kare kare are banana heart (puso ng saging), eggplants, green beans and Chinese cabbage. It is cooked with peanut butter and freshly ground toasted rice. 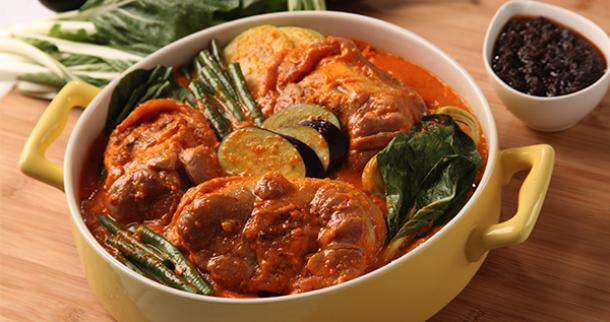 Kare Kare is often paired with shrimp paste (bagoong) to have a harmony of flavors. 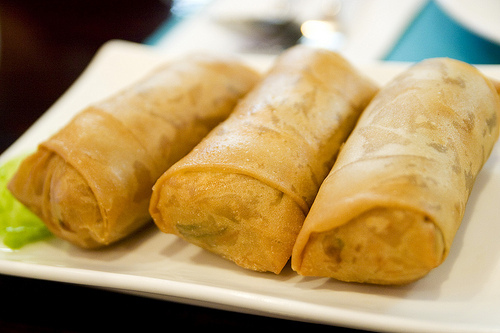 Lumpia is influenced by the Chinese and a famous Filipino dish here and abroad. 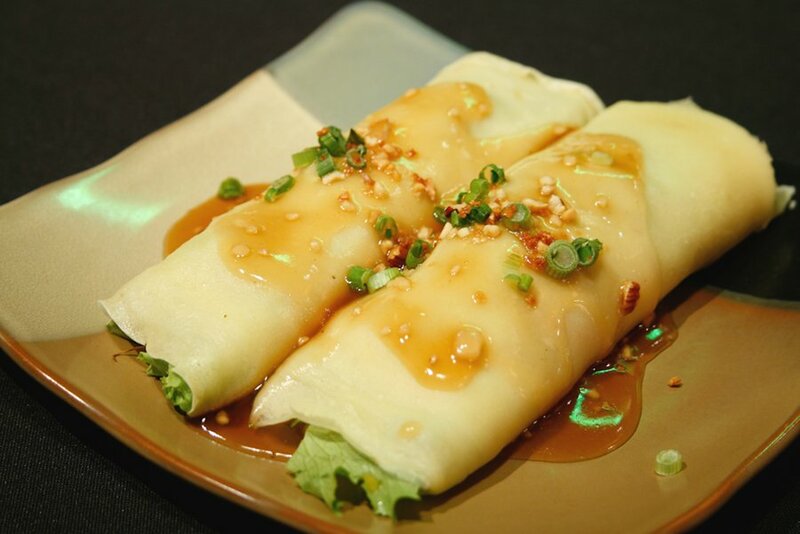 It comes from the Hokkien word “lunpia” and an alternate term for “popiah” or spring rolls. It is a Chinese dish but we Filipinos put a twist into our lumpia. We have different versions of our lumpia. This dish is made from the fresh ubod (coconut heart) with other meats and vegetables depending on different regions of the Philippines. This is encased on a yellowish egg crepe with lettuce inside. This is best dipped in a special sauce made of the stock from the cooked vegetable, cornstarch, peanuts and garlic. This is a famous kind of lumpia which is beloved by kids and adults alike. This type of lumpia is made from ground pork, onions, garlic, carrots and many more spices wrapped in a lumpia wrapper. This is best served with sweet and sour sauce or ketchup. The inside of the shell is like the lumpia sariwa that is made of ubod with meats and vegetables, but the difference with the fried lumpia is that this is wrapped in a lumpia wrapper and fried to perfection. This is best eaten with vinegar as a dip. 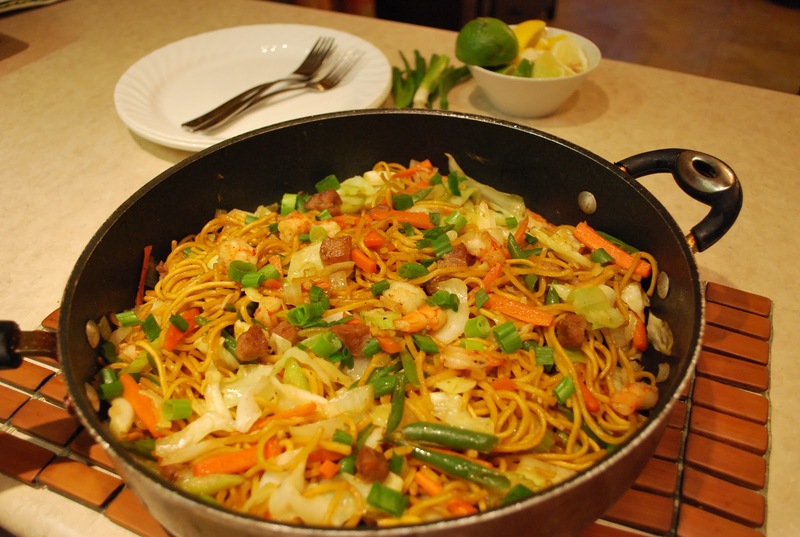 Pancit is always at every Filipino dining table, especially for birthday celebrations. This egg noodles come from the Hokkien word “ pian i sit” which means convenient food. There are different ways to cook pancit, mostly depending on the regions in the Philippines. We have a long list of pancit dishes from bihon, Canton, Lomi, Chami, Sotanghon, Mami and many more. We really love our Pancit! 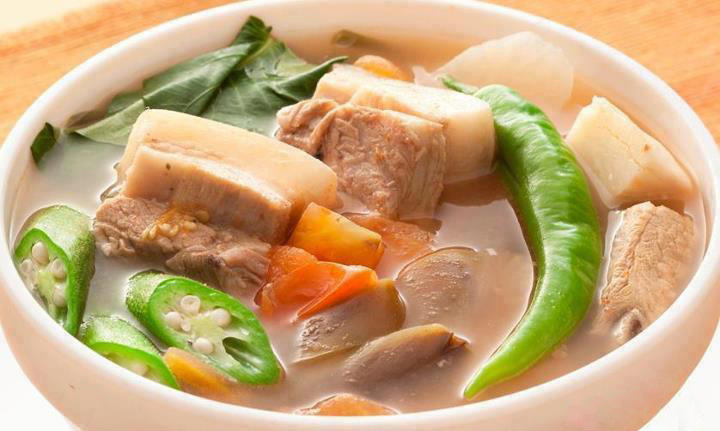 This is a famous Filipino soup, which is known for its sour taste. This is cooked with different meat depending on your preference. Some use pork while others used shrimps and fish. The sour taste is from the tamarind (sampaloc) which makes this dish distinctly appetizing. This makes some foreigners wonder why we love this dish, but Filipinos are in love with Dinuguan. 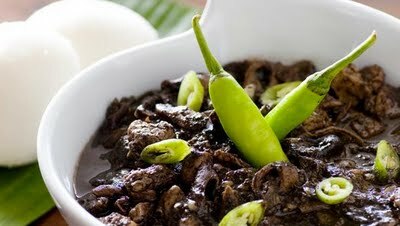 The word “dinuguan” is from the Visayan word which means blood. This dish is cooked with meats from mostly pork offal composed of lungs, kidneys, intestines, hearts, etc. This then is simmered in rich pig’s blood with vinegar and chili which we call in the Philippines as siling mahaba. This does look weird and awful to some, but the taste is amazingly wonderful. This sumptuous dish is made from parts of the pig’s snout, ears, liver and sometimes even brain, fried to cook. 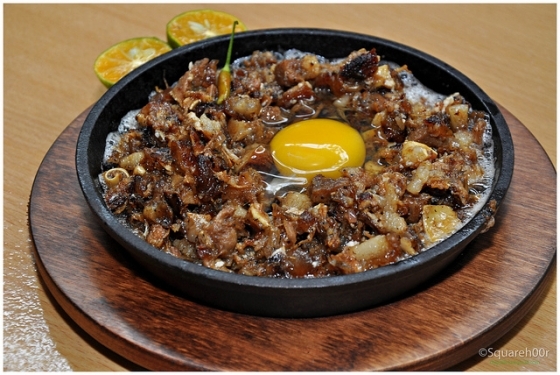 Then it is then sauteed with onions and garlic and served in a sizzling plate with egg on top. This is originally from Pampanga but sisig is now served in most bars and drinking places as well as restaurants here in the Philippines. 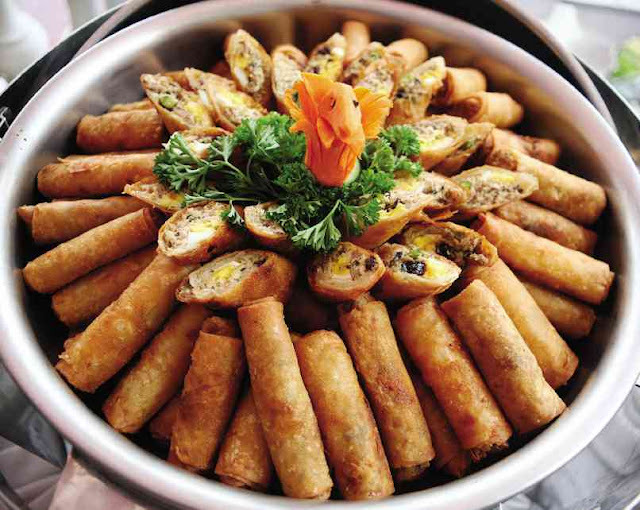 Filipinos love to party that is why we prepare food that are best for gatherings. One food that is present at Filipino parties, especially if there is no lechon is crispy pata. It is basically a deep fried pig leg or even knuckles. Served with a great dip of soy sauce, vinegar and spices like onions and garlic; this fried food will truly make your heart flutter literally and figuratively. This is also one of the most beloved food of Filipinos. Another food influenced by Spain, Caldereta comes from the Spanish word “caldera” which means cauldron. Since Filipinos are known for our ingenuity, we make our own versions through time. 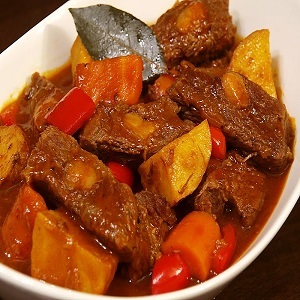 Caldereta is originally cooked with goat’s meat mixed with tomatoes, liver and olives; but now, most Filipinos use different meats like pork or beef. We also add potatoes, tomato sauce, liver, pepper, cheese and many more. We, Filipinos are so in love with food. That is why we always cook or have them in every gathering, big or small . Our love for food gives us the sense of warmth not only in our stomach, but truly in our hearts as well.